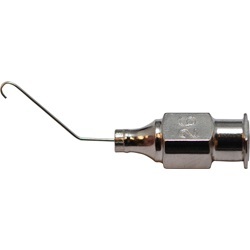 Reusable 26 gauge Mclntyre-Binkhorst Irrigating Cannulas angled or straight shafts. Tip is a 2.6mm wide "J" shaped tip with a blunt front opening. Overall lengths of 18mm. 26 gauge, angled left shaft, 13mm from bend to tip.